Diamond Diaries Saga is a dazzling linker puzzle game. Visually, it’s beautiful! Levels are meticulously designed and the sound effects are mind-blowing. It is King’s most gorgeous “Saga” game you have ever played. Your goal is to link three or more charms of the same color to collect diamonds. You can get them by moving them towards necklaces or opening nesting dolls. As you progress, you will come across complex levels, where collecting diamonds won’t be easy. However, if you know how to make the most out of power-ups, bird charms and combos, completing levels won’t be too difficult. This guide will help you know the power of power ups and boosters. Diamond Diaries Saga can be a pretty challenging once you complete the first region. Seasoned match-3 players may find it easy, but beginners may have to replay levels. Since one level’s layout and goals will be different than the other, it’s important that you know your objectives before linking same-colored charms (pieces). For example: In level 8, you will have to connect pieces with potion bottles of the same color to raise the perfume level. Try to match charms with bottles in every move and if you don’t find a match, make a longer chain to create power-ups so that you can clear clutter for new pieces to appear on the game board. This way you can find a way to link pieces with bottles faster to raise the perfume level. In some levels, jewels will be hidden inside two Matryoshka dolls and you will have to link them with same-colored charms twice to collect jewels. Developers did a great job with the level design, so you will have a tough time completing levels right from level 12 onwards. Always scan the game board to search for longer chains of pieces and quickly connect them to create power-ups as they will be very useful in clearing objectives faster. 2. Power Ups to the Rescue! The first power-up, called “Ray”, can be created if you connect 6 charms. When you get one, link it with two or more charms of the same color to clear pieces from the game board. Noticed those arrows on a Ray charm? Well, those arrows suggest whether pieces will be removed horizontally or vertically, so if there’s an arrow pointing upwards, Ray will shoot up clearing charms vertically. You can create a “Cross-blast” power up if you link nine charms of the same color. Now connect this special charm with two or more pieces of that color to clear charms in the shape of a plus sign. Cross blast can be very useful if you want to clear a several pieces at once. “Star Ray” is the ultimate power up that can clear a lot of charms at once. Create it by linking 12 charms of the same color. When you make one, just link it with 2 or more charms to set off this power-up. It will clear all pieces on the screen in the shape of a star. You can make use of these 3 power ups to collect diamonds, remove obstacles and help jewels reach their destination faster. One of the major goals of this game is collecting diamonds to craft beautiful ornaments. 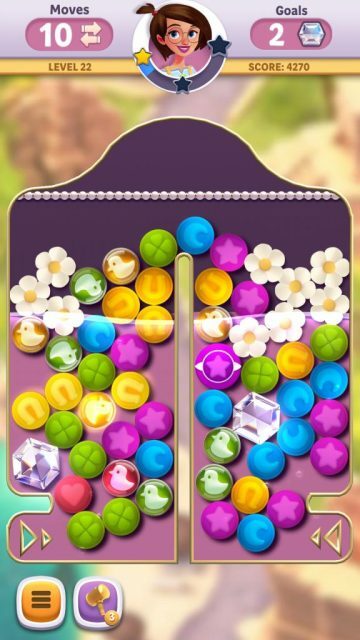 In certain levels, you will have to collect multiple jewels to complete them. But what happens if you run out of moves before completing your goal? Well, you won’t lose all diamonds. Those jewels, which you have collected so far, will be yours if you fail to finish a level. However, for some levels, your goal is to collect only one diamond. 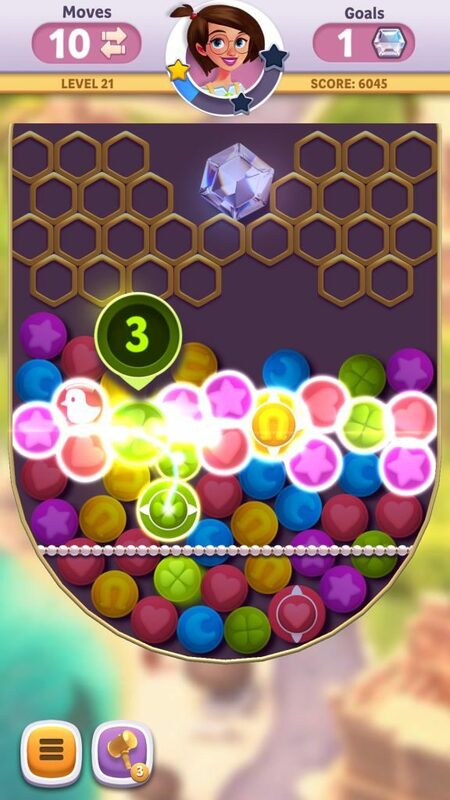 In such a level, you will have to get that jewel to complete it and only then you will be able to pocket it. Please note that you can’t get a diamond if you replay older levels. 4. When Should You Use a Bird Charm? Bird charms can be more useful than power ups. These chirpy helpers can destroy obstacles, open nesting dolls or remove a random charm from the game board. When you spot a bird charm, make sure you link it to two or more charms of that color to activate it. Using a bird charm can be tricky, but it can be very helpful if you know when to use it. If the game board has power-ups, obstacles and nesting dolls, the bird will first activate a power-up. If there are obstacles, then it will destroy a random obstacle. If there are only nesting dolls/keys, the bird will open a random doll or pick a key to open a lock. If there are no obstacles or nesting dolls, then this special charm will destroy a random piece from the game board. Make use of bird charms when you need them the most. If there are fewer moves and more diamonds to collect, then you should use them right away. There are three boosters: Bird Charm, Rainbow and Blast. I have explained what bird charms are in the fourth tip. Using a rainbow, you can remove charms if you link it with two or more charms of the same color. So if you link a rainbow booster with two blue charms, then all blue charms on the game board will be destroyed. Blast removes all pieces in a small radius around it when you link it with charms of that color. Boosters will appear on a game board or you can add them before playing a level. Bird charms are more common, so expect to see more of them. You can use a booster for free, but only thrice. After that, you will have to purchase it using gold bars. Since there are very few boosters in Diamond Diaries Saga, you will have to use them only in certain levels that are tougher to beat. Also, since some levels will have boosters placed randomly on a game board, don’t use them right away. Examine the game board and make the most of boosters that appear on it to complete a level. Use those that don’t appear on a level. For example: If a level has bird charms, then you really don’t need more of them to complete it. 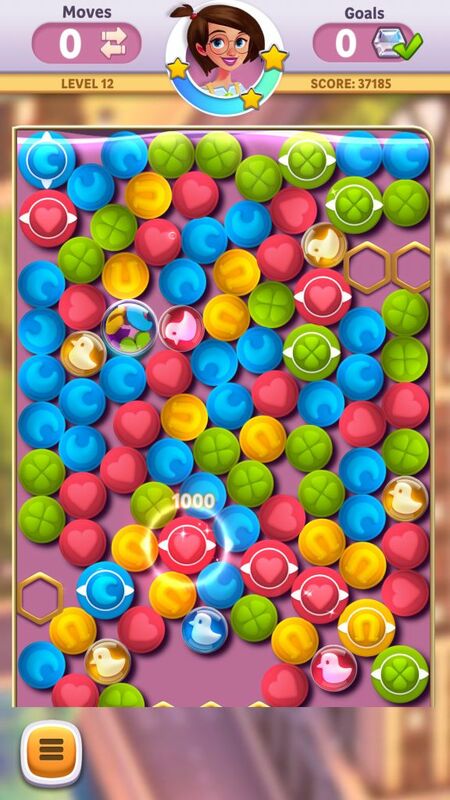 You may use other boosters in your next attempt if you are finding it difficult to beat the level. You will have to collect a certain number of diamonds to complete a jewelry design. Once you have collected them, you will receive a gift box, which may contain gold bars. Collecting diamonds is easy and you can get them even if you fail to beat a level. Save gold bars to buy boosters. Don’t use them to purchase extra moves as you will have to spend a lot of them to get only 5 moves. However, you may use gold bars if the level is very difficult to complete (in case you have replayed it several times) and you could have easily completed in one or two moves. Power-ups, if used wisely, can help you complete objectives before running out of moves. Rays and Cross Blasts can help you clear obstacles, open dolls or make the amethyst reach the necklace quickly. You will have to link a power-up with two or more charms of that color. The power-up sets off on the last charm you drag your finger to. While linking, move your finger from a power-up to the last charm (or vice-versa) if it’s is on the same row/column as the obstacle, doll or any other piece that you want to remove. You can also set-off a chain of cross blasts or rays if there are several such power-ups close to each other. Just make sure the “aim” of a power up falls on other power-ups before activating it. By setting off combos, it will be easier for you to reach your goals faster without requiring the help of boosters or extra moves.